An 1848 painting titled Germania, by Philipp Veit. The Revolutions of 1848, known in some countries as the Spring of Nations, Springtime of the Peoples or the Year of Revolution, were a series of political upheavals throughout Europe in 1848. It remains the most widespread revolutionary wave in European history, but within a year, reactionary forces had regained control, and the revolutions collapsed. The revolutions were essentially bourgeois-democratic in nature with the aim of removing the old feudal structures and the creation of independent national states. The revolutionary wave began in France in February, and immediately spread to most of Europe and parts of Latin America. Over 50 countries were affected, but with no coordination or cooperation among the revolutionaries in different countries. Five factors were involved: widespread dissatisfaction with political leadership; demands for more participation in government and democracy; demands for freedom of press; the demands of the working classes; the upsurge of nationalism; and finally, the regrouping of the reactionary forces based on the royalty, the aristocracy, the army, and the peasants. The uprisings were led by shaky ad hoc coalitions of reformers, the middle classes and workers, which did not hold together for long. Tens of thousands of people were killed, and many more forced into exile. The only significant lasting reforms were the abolition of serfdom in Austria and Hungary, the end of absolute monarchy in Denmark, and the definitive end of the Capetian monarchy in France. The revolutions were most important in France, the Netherlands, Germany, Poland, Italy, and the Austrian Empire, but did not reach Russia, Sweden, Great Britain, and most of southern Europe (Spain, Serbia, Greece, Montenegro, Portugal, the Ottoman Empire). A map of Europe, showing the major events of 1848 and 1849. The revolutions arose from such a wide variety of causes that it is difficult to view them as resulting from a coherent movement or social phenomenon. Numerous changes had been taking place in European society throughout the first half of the 19th century. Both liberal reformers and radical politicians were reshaping national governments. Technological change was revolutionizing the life of the working classes. A popular press extended political awareness, and new values and ideas such as popular liberalism, nationalism and socialism began to emerge. Some historians emphasize the serious crop failures, particularly those of 1846, that produced hardship among peasants and the working urban poor. Galician slaughter (Polish: Rzeź galicyjska) by Jan Lewicki (1795–1871), depicting the massacre of Polish nobles by Polish peasants in Galicia in 1846. Large swaths of the nobility were discontented with royal absolutism or near-absolutism. In 1846, there had been an uprising of Polish nobility in Austrian Galicia, which was only countered when peasants, in turn, rose up against the nobles. Additionally, an uprising by democratic forces against Prussia, planned but not actually carried out, occurred in Greater Poland. Next, the  the pamphlet only urged unification of Germany, universal suffrage, abolition of feudal duties, and similar middle-class goals. 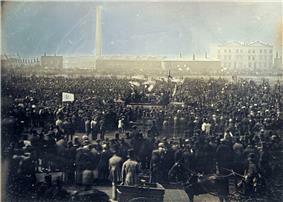 The middle and working classes thus shared a desire for reform, and agreed on many of the specific aims. Their participations in the revolutions, however, differed. While much of the impetus came from the middle classes, much of the cannon fodder came from the lower. The revolts first erupted in the cities. The population in French rural areas had risen rapidly, causing many peasants to seek a living in the cities. Many in the bourgeoisie feared and distanced themselves from the working poor. Many unskilled laborers toiled from 12 to 15 hours per day when they had work, living in squalid, disease-ridden slums. Traditional artisans felt the pressure of industrialization, having lost their guilds. Revolutionaries such as Marx built up a following. The situation in the German states was similar. Parts of Prussia were beginning to industrialize. During the decade of the 1840s, mechanized production in the textile industry brought about inexpensive clothing that undercut the handmade products of German tailors. Reforms ameliorated the most unpopular features of rural feudalism, but industrial workers remained dissatisfied with these and pressed for greater change. Urban workers had no choice but to spend half of their income on food, which consisted of bread and potatoes. As a result of harvest failures, food prices soared and the demand for manufactured goods decreased, causing an increase in unemployment. During the revolution, to address the problem of unemployment, workshops were organized for men interested in construction work. Officials also set up workshops for women when they felt they were excluded. Artisans and unemployed workers destroyed industrial machines when their social demands were neglected. Rural population growth had led to food shortages, land pressure, and migration, both within Europe and out from Europe, especially to North America. In the years 1845 and 1846, a potato blight caused a subsistence crisis in Northern Europe. The effects of the blight were most severely manifested in the Great Irish Famine, but also caused famine-like conditions in the Scottish Highlands and throughout continental Europe. Aristocratic wealth (and corresponding power) was synonymous with the ownership of farm lands and effective control over the peasants. Peasant grievances exploded during the revolutionary year of 1848. Despite forceful and often violent efforts of established and reactionary powers to keep them down, disruptive ideas gained popularity: democracy, liberalism, nationalism, and socialism. In the language of the 1840s, 'democracy' meant universal male suffrage. 'Liberalism' fundamentally meant consent of the governed and the restriction of church and state power, republican government, freedom of the press and the individual. 'Nationalism' believed in uniting people bound by (some mix of) common languages, culture, religion, shared history, and of course immediate geography; there were also irredentist movements. At this time, what are now Germany and Italy were collections of small states. 'Socialism' in the 1840s was a term without a consensus definition, meaning different things to different people, but was typically used within a context of more power for workers in a system based on worker ownership of the means of production. Episode from the Five Days of Milan. Painting by Baldassare Verazzi. Although little noticed at the time, the first major outbreak came in Sicily, Risorgimento. 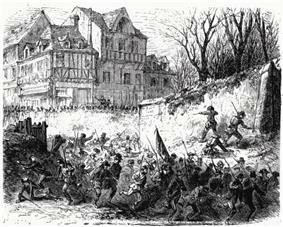 The "February Revolution" in France was sparked by the suppression of the campagne des banquets. This revolution was driven by nationalist and republican ideals among the French general public, who believed the people should rule themselves. It ended the constitutional monarchy of Louis-Philippe, and led to the creation of the French Second Republic. This government was headed by Louis-Napoleon, who, after only four years, established the Second French Empire in 1852. Alexis de Tocqueville remarked in his Recollections of the period, "society was cut in two: those who had nothing united in common envy, and those who had anything united in common terror." The "March Revolution" in the German states took place in the south and the west of Germany, with large popular assemblies and mass demonstrations. Led by well-educated students and intellectuals, they demanded German national unity, freedom of the press, and freedom of assembly. The uprisings were not well coordinated, but had in common a rejection of traditional, autocratic political structures in the 39 independent states of the German Confederation. The middle-class and working-class components of the Revolution split, and in the end, the conservative aristocracy defeated it, forcing many liberals into exile. Denmark had been governed by a system of absolute monarchy since the 17th century. King Frederick VII, met the liberals' demands and installed a new Cabinet that included prominent leaders of the National Liberal Party. The national-liberal movement wanted to abolish absolutism, but retain a strongly centralized state. The king accepted a new constitution agreeing to share power with a bicameral parliament called the Rigsdag. Although army officers were dissatisfied, they accepted the new arrangement which, in contrast to the rest of Europe, was not overturned by reactionaries. The liberal constitution did not extend to Schleswig, leaving the Schleswig-Holstein Question unanswered. Schleswig, a region containing both Danes and Germans, was a part of the Danish monarchy, but remained a duchy separate from the Kingdom of Denmark. Spurred by pan-German sentiment, Germans of Schleswig took up arms to protest a new policy announced by Denmark's National Liberal government, which would have fully integrated the duchy into Denmark. The German population in Schleswig and Holstein revolted, inspired by the Protestant clergy. The German states sent in an army, but Danish victories in 1849 led to the Treaty of Berlin (1850) and the London Protocols (1852). They reaffirmed the sovereignty of the King of Denmark, while prohibiting union with Denmark. The violation of the latter provision led to renewed warfare in 1863 and the Prussian victory in 1864. 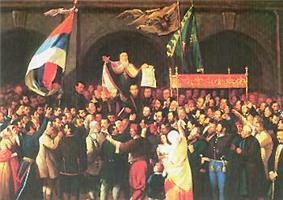 Proclamation of Serbian Vojvodina in Sremski Karlovci. From March 1848 through July 1849, the Habsburg Austrian Empire was threatened by revolutionary movements, which often had a nationalist character. 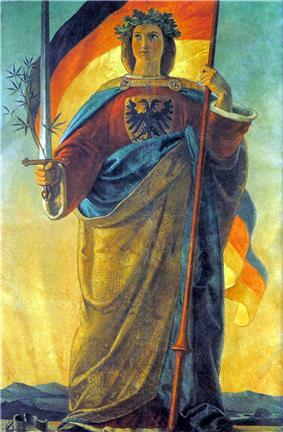 The empire, ruled from Vienna, included Austrians, Hungarians, Slovenes, Poles, Czechs, Croats, Slovaks, Ukrainians/Ruthenians, Romanians, Serbs and Italians, all of whom attempted in the course of the revolution to either achieve autonomy, independence, or even hegemony over other nationalities. The nationalist picture was further complicated by the simultaneous events in the German states, which moved toward greater German national unity. 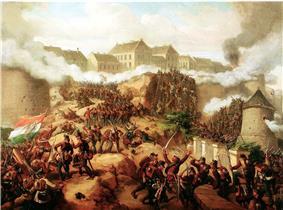 The Battle of Buda, May 1849, by Mór Than. 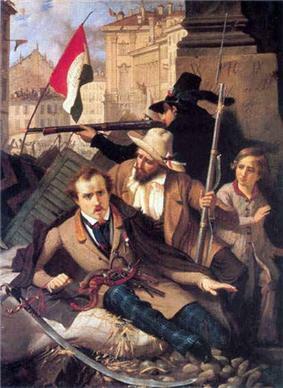 The Hungarian revolution of 1848 started on 15 March 1848, when Pest and Buda (today Budapest) which forced the imperial governor to accept their 12 points of demands. This resulted in Klemens von Metternich, the Austrian prince and foreign minister, resigning. In turn, Emperor Ferdinand promised Hungary a constitution, an elected parliament, and the end of censorship. The revolution grew into a war for independence from the Austrian Empire when Josip Jelačić, Ban of Croatia, crossed the border to restore Habsburg control. The new government, led by Lajos Kossuth, was initially successful against the Habsburg forces, but eventually, after one and a half years of fighting, the revolution was crushed when Russian Tsar Nicholas I marched into Hungary with over 300,000 troops. Hungary was thus placed under brutal martial law, with the Austrian government restored. In the long run, the passive resistance following the revolution led to the Austro-Hungarian Compromise (1867), which marked the birth of the Austro-Hungarian Empire. During the revolution, some minorities of the Kingdom of Hungary, including the Serbs of Vojvodina, the Romanians of Transylvania and some Slovaks of Upper Hungary supported the Habsburg Emperor and fought against the Hungarian Revolutionary Army. Switzerland, already an alliance of republics, also saw major internal struggle. 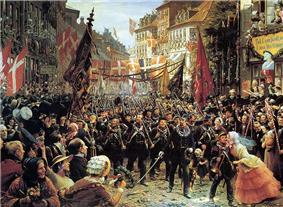 The creation of the Sonderbund led to a short Swiss civil war in November 1847. In 1848, a new constitution ended the almost-complete independence of the cantons, and transformed Switzerland into a federal state. The center of the Ukrainian national movement was in Eastern Galicia. On April 19, 1848, a group of representatives led by the Greek Catholic clergy launched a petition to the Austrian Emperor. It expressed wishes that in those regions of Galicia where the Ruthenian (Ukrainian) population represented majority, the Ukrainian language should be taught at schools and used to announce official decrees for the peasantry; local officials were expected to understand it and the Ruthenian clergy was to be equalized in their rights with the clergy of all other denominations. On May 2, 1848, the Supreme Ruthenian (Ukrainian) Council was established. The Council (1848-1851) was headed by the Greek-Catholic Bishop Gregory Yakhimovich and consisted of 30 permanent members. Its main goal was the administrative division of Galicia into Western (Polish) and Eastern (Ruthenian/Ukrainian) parts within the borders of the Habsburg Empire, and formation of a separate region with a political self-governance. Polish people mounted a military insurrection against the Prussians in the Grand Duchy of Posen (or the Greater Poland region), a part of Prussia since its annexation in 1815. A regency, and in passing a series of major liberal reforms, first announced in the Proclamation of Islaz. Fighting in the village of Risquons-tout during the 1848 crisis in Belgium. In Belgium, the uprisings were local and concentrated in the sillon industriel industrial region of the provinces of Liège and Hainaut. The most serious threat of the 1848 revolutions in Belgium was posed by Belgian émigré groups. Shortly after the revolution in France, Belgian migrant workers living in Paris were encouraged to return to Belgium to overthrow the monarchy and establish a republic. Around 6,000 armed émigrés of the "Belgian Legion" attempted to cross the Belgian frontier. 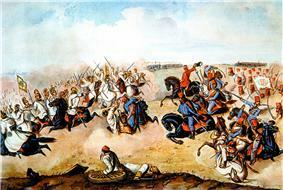 The first group, travelling by train, were stopped and quickly disarmed at Quiévrain on 26 March 1848. The second group crossed the border on 29 March and headed for Brussels. They were confronted by Belgian troops at the hamlet of Risquons-Tout and defeated. Several smaller groups managed to infiltrate Belgium, but the reinforced Belgian border troops were successful and the defeat at Risquons-Tout effectively ended the revolutionary threat to Belgium. The situation in Belgium began to recover that summer after a good harvest, and fresh elections returned a strong majority to the governing party. The Young Irelander Rebellion of 1848 was a small, failed rebellion which broke out in Ballingarry, Co. Tipperary. It was led by the Young Ireland movement, inspired by famine conditions in Ireland and the 1848 rebellions throughout Europe. Elsewhere in Britain, the middle classes had been pacified by general enfranchisement in the Reform Act 1832; the consequent agitations, violence, and petitions of the Chartist movement came to a head with their peaceful petition to Parliament of 1848. The repeal in 1846 of the protectionist agricultural tariffs – called the "Corn Laws" – had defused some proletarian fervour. In the United States, the main impact of the revolutions and their failure was substantially increased immigration, especially from Germany. This, in turn, fuelled the nativist "Know Nothing" movement in the years preceding the American Civil War. The "Know Nothings" were opposed to immigration, especially immigration of German and Irish Catholics and held the Pope, Pius IX, responsible for the 1848 revolutions' failure. 1848 in Canada saw the establishment of responsible government in Nova Scotia and The Canadas, the first such governments in the British Empire outside of Great Britain itself. John Ralston Saul has argued that this development is tied to the revolutions in Europe, but described the Canadian approach to the revolutionary year of 1848 as "talking their way...out of the empire's control system and into a new democratic model", a stable democratic system which has lasted to the present day. Tory and Orange Order in Canada opposition to responsible government came to a head in riots triggered by the Rebellion Losses Bill in 1849. They succeeded in the burning of the Parliament Buildings in Montreal, but, unlike their counterrevolutionary counterparts in Europe, they were ultimately unsuccessful. In Spanish Latin America, the Revolution of 1848 appeared in New Grenada, where Colombian students, liberals, and intellectuals demanded the election of General José Hilario López. He took power in 1849 and launched major reforms, abolishing slavery and the death penalty, and providing freedom of the press and of religion. The resulting turmoil in Colombia lasted four decades; from 1851 to 1885, the country was ravaged by four general civil wars and 50 local revolutions. In Brazil, the "Praieira revolt", a movement in Pernambuco, lasted from November 1848 to 1852. Unresolved conflicts left over from the period of the regency and local resistance to the consolidation of the Brazilian Empire that had been proclaimed in 1822 helped to plant the seeds of the revolution. ... We have been beaten and humiliated ... scattered, imprisoned, disarmed and gagged. The fate of European democracy has slipped from our hands. There were multiple memories of the Revolutions. Democrats looked to 1848 as a democratic revolution, which in the long run ensured liberty, equality, and fraternity. Marxists denounced 1848 as a betrayal of working-class ideals by a bourgeoisie indifferent to the legitimate demands of the proletariat. For nationalists, 1848 was the springtime of hope, when newly emerging nationalities rejected the old multinational empires. They were all bitterly disappointed in the short run. The year 1848, at best, was a glimmer of future hope, and at worst, it was a deadweight that strengthened the reactionaries and delayed further progress. 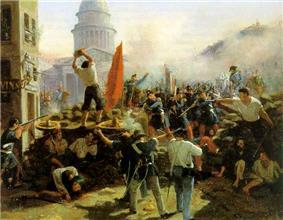 In the post-revolutionary decade after 1848, little had visibly changed, and most historians considered the revolutions a failure, given the seeming lack of permanent structural changes. Nevertheless, there were a few immediate successes for some revolutionary movements, notably in the Habsburg lands. Austria and Prussia eliminated feudalism by 1850, improving the lot of the peasants. European middle classes made political and economic gains over the next 20 years; France retained universal male suffrage. 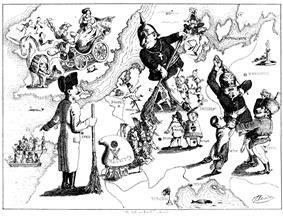 Russia would later free the serfs on February 19, 1861. The Habsburgs finally had to give the Hungarians more self-determination in the Ausgleich of 1867. The revolutions inspired lasting reform in Denmark, as well as the Netherlands. In Chile, the 1848 revolutions inspired the 1851 Chilean Revolution. Great Britain, the Netherlands, Portugal, Spain, the Russian Empire (including Poland and Finland), and the Ottoman Empire were the only major European states to go without a national revolution over this period. Sweden and Norway were little affected. Serbia, though formally unaffected by the revolt as it was a part of the Ottoman state, actively supported the Serbian revolution in the Habsburg Empire. Russia's relative stability was attributed to the revolutionary groups' inability to communicate with each other. 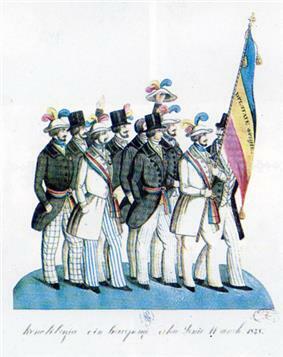 In the Kingdom of Poland and the Grand Duchy of Lithuania, uprisings took place in 1830–31 (the November Uprising) and 1846 (the Kraków Uprising, notable for being quelled by the anti-revolutionary Galician slaughter). 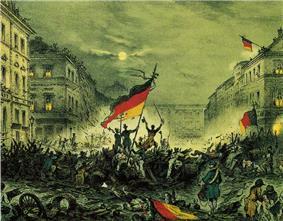 A final revolt took place in 1863–65 (the January Uprising), but none occurred in 1848. Switzerland and Portugal were also spared in 1848, though both had gone through civil wars in the preceding years (the Sonderbund War in Switzerland and the Liberal Wars in Portugal). The introduction of the Swiss Federal Constitution in 1848 was a revolution of sorts, laying the foundation of Swiss society as it is today. In the Netherlands, no major unrests appeared because the king, Willem II, decided to alter the constitution to reform elections and effectively reduce the power of the monarchy. While no major political upheavals occurred in the Ottoman Empire as such, political unrest did occur in some of its vassal states. In Serbia, feudalism was abolished in 1838, and power of the Serbian prince was reduced with the Turkish constitution. ^ Mike Rapport (2009). 1848: Year of Revolution. Basic Books. p. 201. ^ Robert Bideleux and Ian Jeffries, A History of Eastern Europe: Crisis and Change, Routledge, 1998. ISBN 0415161118. pp. 295–296. ^ Merriman, John (1996). A History of Modern Europe: From the Renaissance to the Present. New York: W.W. Norton. p. 718. ^ Breuilly, John ed. Parker, David (2000). Revolutions and the Revolutionary Tradition. New York: Routledge. p. 114. ^ Weibull, Jörgen. "Scandinavia, History of." Encyclopædia Britannica 15th ed., Vol. 16, 324. ^ Kost' Levytskyi, The History of the Political Thought of the Galician Ukrainians, 1848-1914, (Lviv, 1926), 17. ^ Kost' Levytskyi, The History of the Political Thought of the Galician Ukrainians, 1848-1914, (Lviv, 1926), 26. ^ a b c d Chastain, James. "Belgium in 1848". Encyclopedia of 1848 Revolutions. ^ Saul, J.R. (2012). Louis-Hippolyte LaFontaine & Robert Baldwin. Penguin Group (Canada). ^ "Serbia's Role in the Conflict in Vojvodina, 1848-49". Ohiou.edu. 2004-10-25. Retrieved 2013-10-01. Chastain, James, ed. (2005) Encyclopedia of Revolutions of 1848 online from Ohio State U.
Vick, Brian. Defining Germany The 1848 Frankfurt Parliamentarians and National Identity (Harvard University Press, 2002) ISBN 978-0-674-00911-0).